The Mystery of Satan's Angels Cast Down From Heaven Twice: How is that? Satan’s angels were cast out twice? Satan casts them down (Rev. 12:4), Michael casts them down (Rev. 12:9-11), its deducible their going back up is missing in this report. What else is missing? Lets review the symbols used, to deduce what separates the times the angels cast out twice. The woman is also seen in ageless heaven, clearly God’s promise of the Messiah to Eve through Daughter Zion (Gen. 3:15; 37:9-10; Gal. 4:26) and it was in Genesis Satan first tried to destroy her seed by defiling the image of God in man with that of angels (Gen. 6:1-4). Therefore, its deducible the Dragon cast his angels down to earth in Genesis before the flood of Noah’s Day.. [They were called the Nephilim (fallen ones), and these conspired with humanity enticing their contemporaries the “sons of God” to partake of forbidden relationships with the daughters of men. Their role in enticing the sons of God is why they are mentioned first Genesis 6:4, its looking backward to what they did. The fallen angels on earth who had not taken wives were allowed to return to heaven]. So this apocalyptic scene is telescoped from Genesis to the end time week when Michael and his angels cast Satan and his angels out of heaven. That is how they can be cast down to the earth twice. It follows that Satan and his angels are literally cast out and come down from heaven when Michael and his angels cast them out. They will be visible, Satan the Dragon will appear (Rev. 16:13) and so will the demon Kings of the East (Rev. 16:12). Unlike the “spirits of demons” (Rev. 16:14) they retain their corporeal. It wasn’t until the Fourth Lateran Council that the corporeality of angels was seriously rejected. Most Protestants faithfully retain this Catholic tradition. However, that dogma is a massive violation of Occam’s razor as not one scripture implies a creative act occurs whenever angels enter our realm. Rather, Scripture implies an “opening” connects the realms (Gen. 28:12-13, 17; Mat. 3:16; Lk. 3:21; Ac. 7:56; 10:11; Jo. 1:51; Rev. 4:1; 19:11). Jesus did not materialize physical forms to prove He had risen from the dead (Lk 24:39). He did not walk through locked doors or a wall, He suddenly “stood in their midst” (Lk. 24:36; Jo. 20:26). At Jesus’ ascension a cloud received him out of their sight (Ac. 1:9). At the transfiguration the “kingdom of God come with power” (Mk. 9:1) implying a point of connection was made linking the heaven and earthly realms, an opening into heavenly TELEIOS (“complete”) and the earthly MEROS (“incomplete”) 1 Cor. 13:10. This point of connection is where Elijah, Moses and Jesus stand and converse in radiant light. That all three were physically standing together and not spirits is confirmed by Peter’s reaction, he wanted to build tents for them (Mk. 9:23-5). Enoch was translated (3331 μετάθεσις), a transfer not a dematerialization (Gen. 5:22; Heb. 11:5). Paul did not know if he went to third heaven in the body or out (2 Cor. 12:3) which could not be the case if he couldn’t enter heaven physically. Elijah was taken up into heaven in a chariot ascending into heaven through a vortex opening said described as a “whirlwind”. New Jerusalem descends from heaven, it does not materialize on earth and its clear mankind will physically walk its streets (Rev. 21:2-3). A study of 1 Cor. 13:10 indicates within the meta-universe two parallel universes consist. The more substantial reality is the TELEIOS “kingdom of God”, not our MEROS “that which is in part” because it lacks the dimension of the revelation of God (1 Cor. 13:10-12). In the infinite mind of Christ the Multiverse (meta-universe) consists and has its being (Col. 1:17), in Him both human and angel exist and have their being (Ac. 17:28). This does not deny spirits (whatever their nature) exist in heaven (1 Ki. 22:21), only that they are the only form of life within it. Evil spirits and demons wandering the earth longing for the corporeality they lost in the flood (Gen. 7:21-23) cannot be confused with Satan and the rest of his angels who retain their physical form (Dan. 10:13; Rev. 12:7-8; 16;13). Only God’s restraining decree (2 Thess. 2:7; Rev. 9:1, 14-16) prevents these from appearing physically now on the planet. Any time after God lifts that restraint is when they can appear, no doubt disguised as an extraterrestrial race. 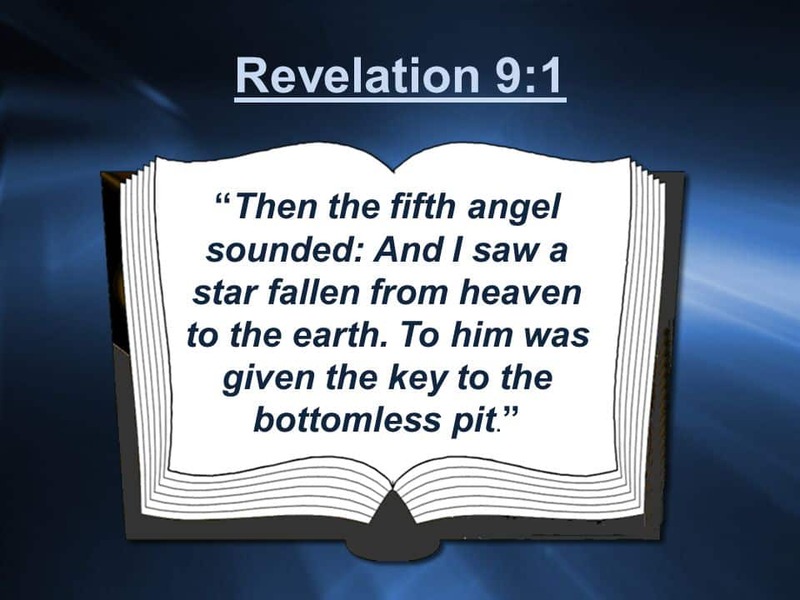 So the angels Michael kicks out of heaven will appear on earth physically, in effect the Nephilim will have returned just as it was in the Days of Noah. Its not symbolic, its literal. They will walk among us, deceiving mankind they offer immortality, a “workaround” to God’s denying humanity this casting them out of the garden of Eden (Gen. 3:22-24), just as they deceived men in the Days of Noah (Gen. 6:1-4).